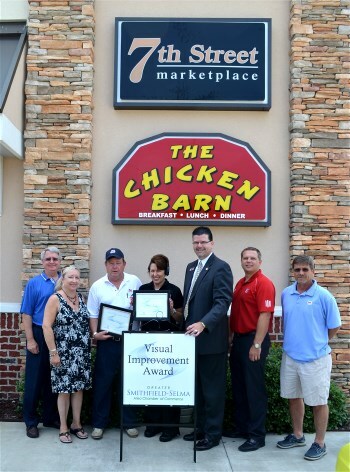 The Smithfield-Selma Chamber of Commerce has presented the Visual Improvement Award to 7th Street Marketplace and The Chicken Barn, both located at the corner of East Market and 7th Streets in Smithfield. The businesses were recognized for improvements made over the last couple of years to the property, including new construction and extensive landscaping. Larry Stancil owns the building and operates 7th Street Marketplace, and upscale convenience store. Denise Johnson is the proprietor of The Chicken Barn, a long-time local restaurant.